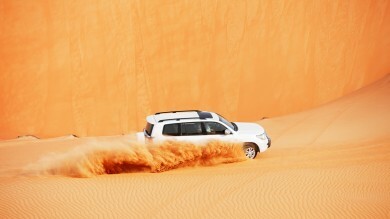 Customize your trip with a local travel expert in UAE. The water temperature in and around Dubai is perfect for surfing and bodyboarding. With bright skies, warm seas, and 50 kilometres of coastline, it’s really no surprise the glittering metropolis of Dubai has become a world leader in water sports. Water sports in Dubai are one of the most popular things to do in Dubai. Here you’ll find everything from yacht sailing and flyboarding to shark diving and jet skiing. Too many choices? Here are our top 10 picks for water sports in Dubai! Dibba Rock, Snoopy Rock and the Musandam Peninsula are popular sites for diving. Dubai is a year-round scuba diving and snorkelling destination, and everyone from beginners to semi-professionals is catered for. Trips are also incredibly easy to arrange, with many tour operators offering packages. World class diving professionals will keep you safe as you explore the beauty of the near shoreline and historic shipwrecks alike. The most popular sites for diving are Dibba Rock, Snoopy Rock and the Musandam Peninsula, which have some of the region’s largest concentrations of marine animals. Good to know: Water temperatures, even during the winter months, average at 22°C, rising to 33°C in the summer months, so a wetsuit is definitely optional! 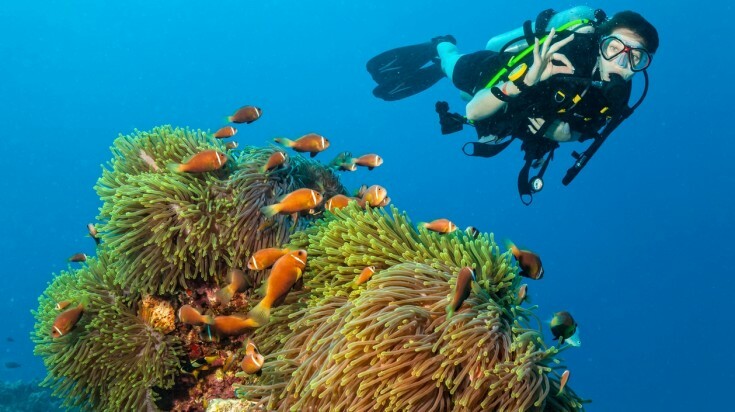 Discover scuba diving in Dubai with this 2-hour scuba diving tour or this 8-hour tour with lunch. Dubai Aquarium offers a chance to dive with the world’s largest collection of sand tiger sharks from the safety of a diving cage in their 10-million-litre aquarium tank. You’ll see a side of these remarkable creatures that can’t be seen any other way as they move unphased around you. And if you don’t want to put on full scuba gear, you can enjoy the same experience as a snorkeler! Good to know: Shark dives are held three times daily, with space for four divers each time, so make sure you book! Bookings can be made at the ticket counters at the aquarium, or online. Jet skiing is an adrenaline pumping activity to do in Dubai. 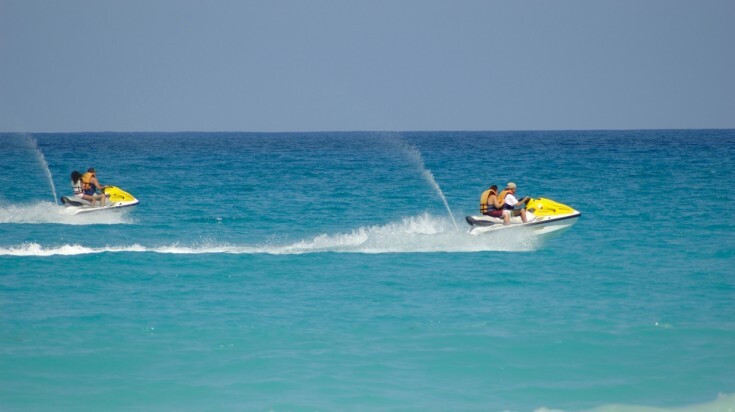 Hitting speeds of up to 70 km/h, jet-skiing is one of the fastest water sports in Dubai. Easy to master, you’ll soon be racing across the waves in a surge of adrenaline, unlike anything you’ve felt before. Should you prefer, sightseeing tours by jet-ski are also available. Lasting between 30 minutes and two hours, tours take in the seven-star Burj Al Arab hotel, Jumeirah beach, and the famed Palm Jumeirah. Good to know: Although restricted in most of the coastline in Dubai, jet-skiing is permitted at Jumeirah beaches 1 and 2, at Dubai Marina, and Umm Suqeim beaches 1 and 2. Drivers below 16 years of age need to be accompanied by an adult. Children aged 14 years and younger are only allowed to ride as a passenger. If a slightly more sedate pace is more your bag, there are also plenty of opportunities to turn your hand to sailing, even if you’ve never unfurled a sail before. Everything from small boats to luxury yachts can be hired in the Emirate, with or without staff. There is perhaps no better way to explore Dubai from the water! Good to know: For sailing courses, try the Dubai Offshore Sailing Club at Jumeirah Beach, the hub of the Emirate’s sailing life. Entry ticket to Bollywood Dubai. Flyboarding is a new water activity to enjoy in Dubai. As impressive as it is exhilarating, flyboarding is the new kid on the block. 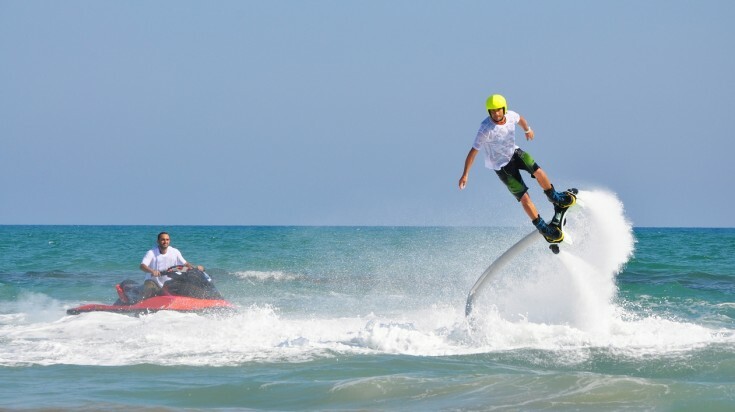 One of the most popular adventure activity in Dubai, participants can expect to glide across the surface of the waves before rocketing an incredible 10 m above them, and even manage somersaults with practice, thanks to nothing more than a couple of water jets located on the bottom of the board. Good to know: Head to Dubai Fishing Harbour to try flyboarding for yourself. Prices start at USD 80* for 20 minutes. Diving and snorkelling are not the only ways to come nose to nose with the marine world’s top predators in Dubai. Walk underwater among marine life at the Atlantis Hotel. The Atlantis Aquatrek allows divers to breathe and walk underwater with the help of a special helmet. Not up for getting wet? Visit the Dubai Aquarium and gaze at the sea creatures from dry land. Dubai Aquarium is home to 300 sharks and 70 different marine species from rays and colourful coral fish to a 5-meter-long, 250-kilogram monster croc. Located on the ground floor of Dubai Mall, the centrepiece attraction is the 148-meter-long tunnel that takes you beneath its giant main tank. Good to know: Don’t miss the new night creatures exhibition, featuring the full range of beasts that can endure Dubai’s desert conditions. There’s everything from fruit bats to hedgehogs and giant camel spiders! The tranquil shoreline waters of Dubai are a great location for stand-up paddleboarding, with the flat waters around many of its most famous beaches — from Burj Al Arab beach to Palm Island Jumeirah — permitting the activity. Whether you opt to go alone, with an instructor or as a group, you won’t regret the views and experience you get from a SUP. Good to know: Boards and paddles can be rented at Kite Beach (also known as Fazza Beach). This is also the place to join local kite surfers, generally in the afternoon when the wind picks up. 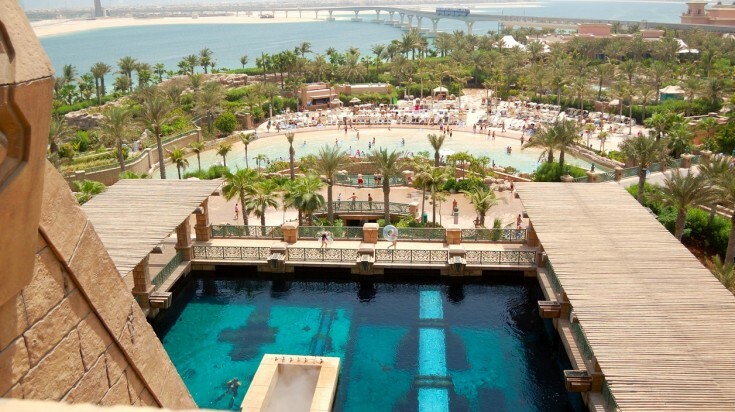 The Palm Hotel's Aquaventure is one of the biggest water parks in Dubai. For a water adventure in Dubai that anyone of any age can enjoy, make sure you check out Dubai’s water parks. Regularly ranked as some of the best in the world, Jumeirah’s Wild Wadi Water Park boasts over 30 rides and slides, while the Palm’s Aquaventure includes attractions such as its Leap of Faith, that sees you ride through a shark-infested tank. Both also have areas specifically dedicated to younger children too. Good to know: Stay at Atlantis, The Palm, or several hotels on Jumeirah Beach and you’ll find you’ve been given free tickets to these water parks! The Seabreacher is a two-person submersible decorated to look like a shark and is the latest way to get the adrenaline pumping during your time in Dubai. Not only can it submerge for a unique view of Dubai’s waters through the glass cockpit, but it can also glide over them like a breaching shark while hitting speeds of 100 km/h. Good to know: Forget about the controls and enjoy the ride, the Seabreacher is operated by an expert instructor, making it suitable for anyone over the age of 16. Believe it or not Dubai offers some amazing prospects for surfing and bodyboarding. Surfing lessons can be found in the waters of Jumeirah Beach, with the Burj Al Arab as a backdrop. The water is a very comfortable 25°C and the waves small enough to ride as a beginner without getting swamped each time. Good to know: The surf season in Dubai extends between October and April, with the best months being December to February. Dubai’s coastal gulf location has made it one of the best places in the world to enjoy water sports. From more traditional past times such as sailing and diving, to the likes of stand-up paddleboarding and riding in the Seabreacher, water sports in Dubai have never been so varied. You’re just bound to find a new passion however long or short your time in the Emirate!